North Korea tested its new intermediate-range ballistic missile, the Hwasong-12, three times in April 2017. North Korea’s three major failed ballistic missile tests in April 2017 involved the Hwasong-12 intermediate-range ballistic missile, a U.S. government source with knowledge of the matter told The Diplomat, speaking on the condition of anonymity. Pyongyang conducted tests of the system on April 4 and 15, from near its naval base at Sinpo, and another test on April 28 from the Pukchang Airfield in South Pyongan province. The first two tests out of Sinpo both failed, but the first produced limited flight to a range of 60 kilometers with an apogee of 189 kilometers. Both tests out of Sinpo had been previously reported to involve a new Scud-variant known as the KN-17 by the U.S. government. North Korea has introduced a new short-range Scud-variant, which was first tested on May 28. According to the source, a missile known within the U.S. government as the KN-17 was indeed tested out of Sinpo, but is not, contrary to previous reports, a single-stage, liquid-fueled Scud-variant with terminal maneuverability. 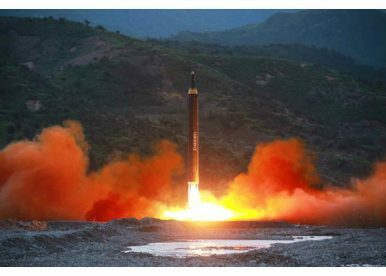 Instead, it’s the same missile that North Korea successfully tested on May 14 from near Kusong: the Hwasong-12 IRBM. The source added that North Korea’s April 28 launch from the Pukchang airfield in South Pyongan province, previously reported as an unknown missile, also involved the Hwasong-12 IRBM. The IRBM in that test exploded shortly after launch. The United States government uses the “KN” missile naming system to designate systems under development and in use by North Korea. For instance, the Pukkuksong-2, the solid-fuel medium-range ballistic missile shown first in February, was designated the KN-15 — the first new publicly reported KN designation in 2016. North Korean systems receive new designations if they are substantively different from previously known systems. The repeated testing of the Hwasong-12 IRBM in April is significant and serves to deprecate previous analysis that assumed the KN-17 was North Korea’s new Scud and possibly an anti-ship ballistic missile prototype. There are a few implications given this newly reported data. First, if, as it appears, the Hwasong-12 is based on North Korea’s indigenously developed high-thrust liquid-fuel engine, first demonstrated in March, it may be the case that Pyongyang had trouble perfecting the system with its first attempted flight tests. This counters previous impressions that Pyongyang’s test on May 14 was the first-known flight attempt for the Hwasong-12. Three failed tests prior to a success in May suggests that North Korea likely had to make changes to the system to achieve a successful test. For instance, given that the April 4 test was reported to have “pinwheeled” in flight, North Korea may have encountered problems with flight stabilization for the new missile. The Hwasong-12 uses a skirt paired with vernier engines instead of grid fins, which Pyongyang has used on its Pukkuksong-1 submarine-launched ballistic missile (KN-11). The missile could also have encountered an engine failure in flight or improper flight stage separation. Second, observers, including at The Diplomat, had speculated that the April 4 and April 14 tests could have served a signaling purpose given reports at the time of the USS Carl Vinson strike group’s deployment to the Korean peninsula. Had the Hwasong-12 test attempts out of Sinpo succeeded, North Korea would have demonstrated a capability to strike U.S. forces at Guam. Third, given that the Hwasong-12 was tested throughout April and in mid-May, North Korea’s May 28 test of the new “ultra-precision” Scud with terminal maneuverability was the first — not potentially the third — attempted flight test of the system, suggesting that Pyongyang’s considerable experience with single-stage, liquid-fuel missiles has held up. North Korea’s exploration of terminal maneuverability, thus, suggests an iterative improvement to its existing Scud programs.